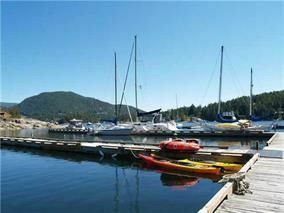 This flat level building lot is accessed via paved road and may offer some view of the ocean/harbour from a rancher style home. You can buy now and build later and moor your boat in the marina for a small monthly lease rate. Call listing realtor for details. Farrington Cove includes a tennis court and water feature area as well as a community septic treatment plant. This south facing bay is developing nicely with lovely new homes. Bare land strata fee $80 per month for road, sewer, tennis court, and water feature maintenance.